My grandfather had a gift for telling stories. My favourite beginning to any conversation with Grandpa was "Sheila, did I ever tell you about .... ", followed by stories about people and events, familiar and unfamiliar, all told with wit and uncanny perception. Grandpa was a keen observer of life, and he listened to the stories of other people as much and more than he told his own. When I was very young, he told me that it was a mistake to fall in love with your own "smart-ness"- his exact words as I recall were: "Sheila, every person you meet knows at least one thing that you don't, and if you don't listen, you'll never find it out". We taught Adam to tell stories in a comic-strip format. 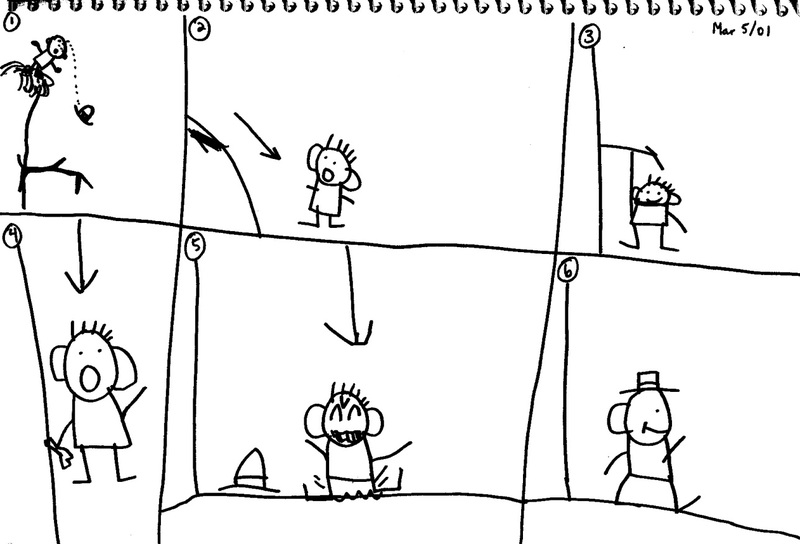 When Adam was 7, I started drawing out simple interactions and conversations for him using sequences of comic "cells". When he was 10 (and able to draw), I set up open-ended "What next?" drawings where I drew the first action, and he drew the reaction or next action. The first time we tried this, he simply copied my drawing. So I modelled the reaction in a silly dramatic Saturday morning cartoon way, falling off my chair over and over until he said "Cut that out!" 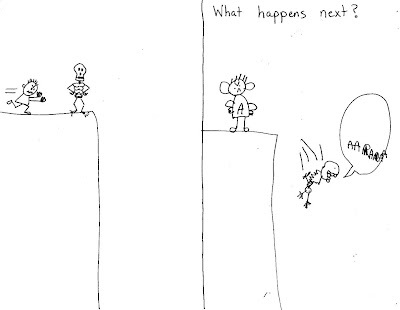 - but he got it, and he drew a sequential picture. When Adam was 11, he drew his first longer story after seeing the movie "The Emperor's New Groove" one time. I drew a scene from the movie, and then he drew the sequence of events that followed - he had taken in the whole story, and was able to tell it back to us. This story was only the first of many, all demonstrating humour, imagination, understanding of cause and effect, and human emotional reactions - things that many people have assumed are not intellectually possible for individuals severely affected by autism. Drawing opens up a channel that allows a person with low verbal skills to communicate more complex thoughts and concepts - to share their true wit and intellect, their opinions, their hopes and their dreams. I recommend that you take my grandfather's advice and listen to the story to learn the thing you did not know before ... then let that information change the way you see and interact with people with autism.